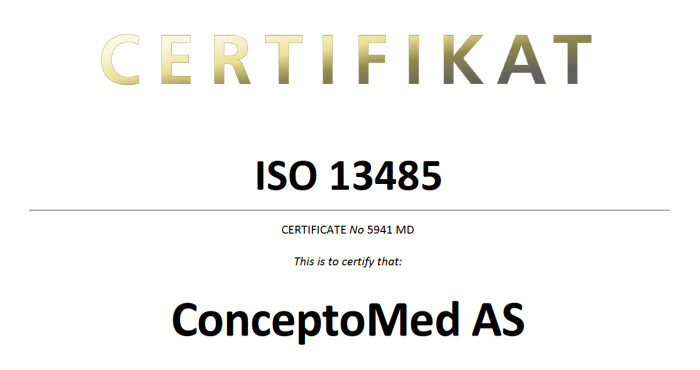 ConceptoMed is proud to announce that it successfully passed the ISO 13485 quality assurance audit, and was issued the international ISO 13485 certificate by SP, our Notified Body. The ISO 13485 standard specifies requirements for a quality management system where an organization needs to demonstrate its ability to provide medical devices that consistently meet customer and regulatory requirements applicable to medical devices, certifying that the organization’s Quality Management System for Medical Devices responds to this rigorous standard for the design, development, and production of medical devices. ‘Achieving the International Organization for Standardization certification for our quality management system reflects our commitment to the development of innovative, safe and effective products for the global market’ commented Christian Mide, CEO of ConceptoMed. Marit Martinsen, Head of Regulatory Affairs and Quality Assurance in ConceptoMed, stated that ‘the ISO 13485 certification illustrates ConceptoMeds strong commitment to quality and our ability to reach milestones crucial to the regulatory processes required for worldwide medical device commercialization’.